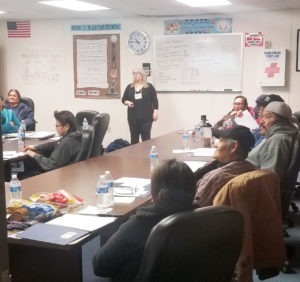 The Senior Community Service Employment Program (SCSEP) offers trainings on subjects like resume writing, navigating impromptu interviews, crafting “the elevator pitch”, and finding hidden job markets. 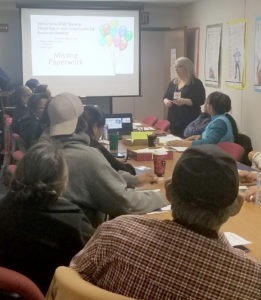 Sixteen people attended the training session at the Navajo Department of Workforce Development in Chinle, including Patricia Tso, a participant living an hour away who was determined to attend, and one non-participant who was intrigued by our presentation topics. Participants Maxine Nez and Harvey Baker had many questions, while host agency supervisor Velma Yazzie assisted with translations. At the Goodwill Career Center in Phoenix, SCSEP participants Azar Hakami, Martha Vasquez, John Garza, Jesus Zamarron, and Dianne Malone were advised of the many advantages of Goodwill’s services by host agency partner Troy Maskell. The trip was a wonderful reminder that our program’s success depends on the help of great partners like Goodwill, and pueblo workforce centers like the Navajo Department of Workforce Development.